Many of the local trains in the Brno area are loco hauled by class 242 electrics. 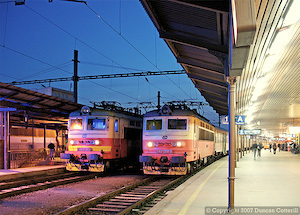 As darkness fell on the evening of 23 February 2007 242 272 (left) prepared to leave Brno hl.n. with Os4614 to Žďár nad Sázavou while 242 228 waited alongside with Os4728 to Letovice. This was about as bright as it got during the trip. 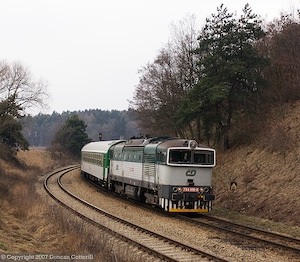 754 016 approached Kralice nad Oslavou with R669 from České Budějovice on 25 February 2007.
his report describes a short spur-of-the-moment trip to the Czech Republic. Six months had passed since my last Czech trip and I was suffering severe withdrawal symptoms. I hadn't planned to go until much later in the year but having a few days off and finding that Ryanair still had cheap fares available to Brno swung the decision. The intention was to spend 3 days on the Brno - Jihlava line, a route with a reasonable level of locomotive haulage, nice scenery and plenty of open locations suitable for low winter sunshine. In the event there was no sun so most of the time was spent travelling around. Saturday was spent travelling from Třebíč, where I was staying, to Jihlava, Znojmo, Hrušovany nad Jevišovkou, Brno and back to Třebíč. Sunday looked like it might be a better day and was spent around Kralice nad Oslavou, waiting in vain for the sun to come out. There seemed to be no chance of good weather on Monday so I returned to Brno via Jihlava, Pardubice and Olomouc. There have been some big changes since my last visit in July 2005. The two-hourly Brno - Plzeň expresses are still loco hauled by class 754s and these locos are also booked to work a number of stopping passengers. However, the class 742s and class 850s that used to work the remaining stoppers have been replaced by class 854s. A couple of 742 workings were seen but they may well have been substituting for unavailable railcars. A trundle down the line on Saturday 24 February encountered only class 810 4-wheel railbuses and their class 814/914 reincarnations. This was a shame as the line is quite photogenic but no longer sees any loco hauled passengers. The Fridays only Praha - Znojmo finished at the end of 2006. There does seem to be a fair bit of freight around Znojmo and plenty of 742s were stabled around the station and depot area including 742 100, 283, 306, 428 and 430. This is the western section of the Břeclav - Znojmo line and is fairly uninteresting scenically after the first couple of km from Znojmo. The only passenger train seen (and travelled on) was worked by a Břeclav class 842. There were a number of large rail connected grain silos along the line so there should be some freight traffic. Another rural backwater but quite a scenic one, particularly from Budkovice north to Střelice. The line runs through some nice hilly country and the viaduct south of Moravské Bránice is spectacular. The line is also notable as many passenger services are worked by old class 850 railcars and it's almost certainly the last stronghold of the type. A few 842s were seen as well. All loco hauled passengers seen on the line were worked by class 242s. There were a number of 230s around Jihlava and Havlíčův Brod but none were on passenger duties. The fast trains on the Havlíčův Brod- Pardubice line now run through to Jihlava and R886 and R889 are actually through workings from Table 240 (albeit with a change of train number at Jihlava) worked by class 854s. After trundling around on secondary lines for two days, it was time to cover some miles at high speed on EC107, courtesy of 151 014. This is the loco in red and yellow advertising livery and is better travelled behind than photographed. No class 130s were seen on passengers but the class did seem to be more common on freights than previously. Class 163s were seen on all stoppers en route. The upgrading east of Česká Třebová appears to be complete and we covered the 40 km to Zábřeh na Moravé in 20 minutes from a standing start. The next 46 km to Olomouc were a lot slower and single line working was encountered in a couple of places. There's always something interesting on view at Olomouc and this time was no exception with 751 144 in the yard and 140 089, 141 054, 749 257 and 770 107 outside the depot. Locals to Uničov and Moravský Beroun were 851 worked. The main incentive for travelling via Olomouc was to see what was on the locals to Nezamyslice. Olomouc depot has recently acquired a number of class 141s to work these services but one turn seen was being worked by a 163. 141 037 was seen on Os3815 at Nezamyslice. Photographically, the trip was a total washout but it did allow me to catch up with recent developments. There were significant changes from the start of the new timetable in December 2006 and a further decline in the amount of diesel haulage. The removal of class 130s from passenger duties was another disappointment but at least they're still around on freights. On the other hand the veteran class 141s have more booked passenger turns than for many years... and actually seem to work some of them. Brno - Jihlava is still interesting with a reasonable number of class 754 (or 750) hauled trains and class 742s still appear occasionally substituting for failed units. The extent to which 854s have taken over workings west of Brno was a bit unexpected but at least the older class 850s haven't disappeared completely. The invaluable Siťové Jízdenky tickets are still available and at Kč1053 for a week's first class travel still fantastic value.